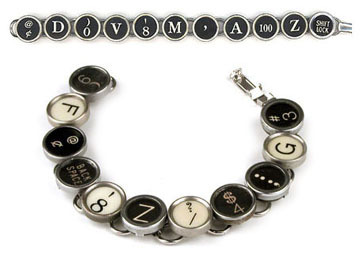 This bracelet features authentic typewriter keys recycled from vintage typewriters as seen on this site. Available in two colors: all black or random. The standard length is approximately 7 1/2" long with 11 keys. In base metal backing. Custom bracelets with your choice of letter, color and size can be ordered at extra cost. Please contact us for pricing.